Part of our robust galvanised steel St Ives traditional exterior lighting range, the Funnel Down Light has a distinctly maritime feel. Inspired by - yes, you’ve guessed it – a ship’s funnel, this wall-mounted down light could be used as a porch light but is particularly good for lighting up pathways and corridors, both inside and out. 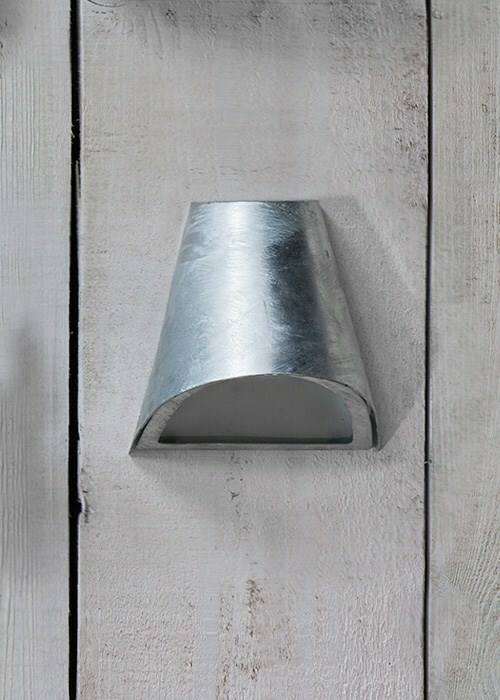 The Funnel Down Light’s hot-dipped galvanised steel body is completely weatherproof, making it suitable even for coastal locations. The light’s slightly rough finish and appearance of runs are as a result of the hot-dipping process and are an intrinsic part of its look. Requires 1 x GU10 halogen bulb (supplied). For bulb replacements try out new 5.8W LED GU10 energy saving bulb.